Lynettea let me put this picture on my blog, as she was concerned that I didn't believe her reasons for having to send me to the cat hotel. 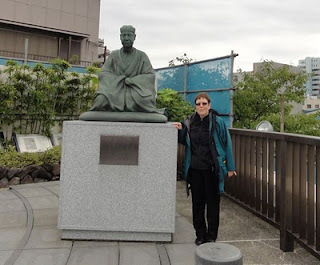 It is a picture of her beside the statue of Basho (revered ancient Haiku poet) in Tokyo. I am not sure why she is smiling when I am not there. It was all climbing up stairs to get to this place. No wonder she got tired. 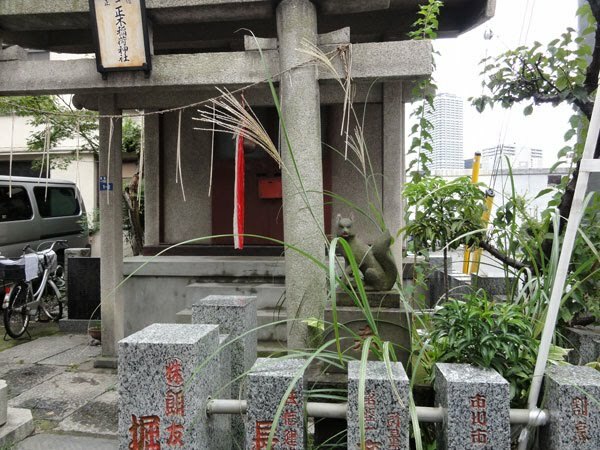 In the small street below this place dedicated to Basho there was a 'fox shrine'. You can see the fox in the photo if you look hard. Its face is near the central column in the photo just above the grass blade. 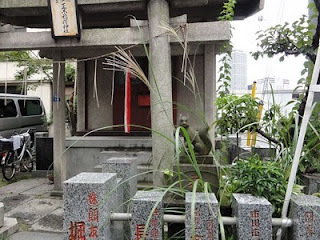 (the fox shrines are important to farmers as the fox is considered the messenger of Inari the kami of rice. Maybe foxes protect the crop? 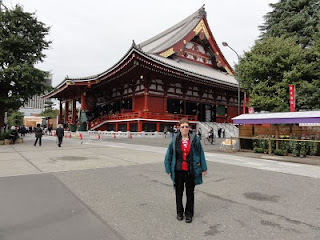 The next picture is of Asakusa Shrine, a very famous shrine in Tokyo. A Japanese couple offered very kindly to take Lynettea's photo. After they took it she couldn't see anyone else in her party and spent some time wandering round feeling nervous before she located them. (If I had been there this would not have happened, as I am exceptionally alert and would not have got lost). Some of the party who were given papers with bad fortunes on them were told to tie them to a tree so the bad luck would be blown away. I am feeling a bit more rested now after my stressful 'holiday'. I am back home. I got here on Monday evening with the lady from the cat hotel. I ran out down the back so she couldn't get me again. I had to stay under a cushion most of the time in the hotel, because she had a strange kind of 'reflector bed' that I couldn't get the hang of. There was a Burmese next door who ate cheese. I had a little bit too, because I couldn't see why he should have favours while I had no compensation for being in the dungeon. Now Lynettea says my behaviour is 'disturbed' and she doesn't like me clawing her and running to the door miaowing anxiously when she goes out and comes back. No-one brushed my furs while I was away and clumps of under fur came out when Lynettea brushed me. Well they did give me food, but I just can't get used to hotels. Lynettea didn't see any cat cafes in Japan. She did pat a cat at a shrine, after asking the carer. The cat was white and sitting in a little cardboard box. She thought it might be an older cat. She didn't write many haiku, as it was mostly sightseeing. If she had taken me I could have helped her with her haiku. I will try to get some photos of Japan from her camera. She is still deaf from the plane and very tired, so it will take a while. Much better for her to stay at home and do her duties.